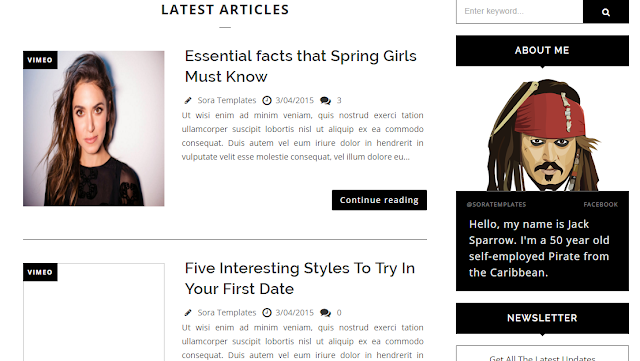 Today i'm gonna give you another Elegant and Adorable template for your blogger which is designed just for Fashion designers ..Flatness Blogger Template has Marvelous layout with great responsive features .. This Template has million of demand just for Fashion industry due to photography Widgets .. This Template and Theme has been designed for fashion Blogs .. Classic and many Social Widgets Attracts the number of audience thats why most of people prefer this adorable template .. Flatness Blogger Template has many Features that make it best and most demanding Template ever for Fashion Industry and designers .. Flatness is totally Responsive with Mobile Friendly Template ... Marvelous Menu bar with Classic Drop Down .. Flatness is designed according to the SEO features .. it is fully Advanced SEO optimized Template and also Google Adsense Ads Friendly .. Flatness is fast loading theme with Elegant interface .. It has Wide Content Area with number of Widgets and Social bookmarking features is also include .. Flatness Blogger Template has Classic Black Footer with 3 Column Widgets .. you can Download this Adorable template for your fashion blog , but first you should must have to seen these feature that i'll post below ..
Fast loading speed with Elegant Layout ..
Two Massive Menu Bars with Classic Drop Down Option and Social Widgets ..
Adorable Black Footer with 3 column Widgets .. So here we go , now we are providing you according to fashion Designing Themes and just for demanding of Photographers , because many People requested me that i share this template for them .. son now i'm gonna give you "Flatness Blogger Template Free" , you can Download this template from below Download Button , this product is totally free you can edit this template according to your design and desire if you have some basic knowledge about HTML and CSS ..
After Download this template Extract the Zip file , there you'll see Flatness Free Version.xml file ..